More than ten years ago, government and military customers realized this complexity was undermining software radio's reliability and maintainability as well as hindering feature upgrades and technology refresh cycles. They also wanted to improve compatibility between vendors and reuse software radio hardware platforms for different types of signals and new applications in the future. So those interested in addressing these issues started work on VITA 49.0, which became known as VRT, for VITA Radio Transport. This article describes how VRT has evolved and improved in the past several years via VITA 49.2. This article is an update to a VITA 49 article we published two years ago. To read the original version, click here. Approved as an ANSI standard in 2007, VITA 49.0 represented the first official standard for VRT, but it only defined receiver functions using the VRT IF Data and Context packets. After demonstrating its usefulness by early adopters, system designers wanted to extend its scope to encompass even more elements of software radios. The original VITA 49.0 standard omits support for transmitters, control and status functions, and any signals other than digital IF. To address these shortcomings, VITA 49.2 was initiated with new packet classes represented in Figure 2. The original IF Data Packet is replaced with the Signal Data Packet, which not only supports digitized IF signals, but also baseband signals, broadband RF signals, and even spectral data. Signal Data Packets are backwards compatible with IF Data Packets, with new identifier bits to specify the data type. To support bi-directional radio signals, Signal Data Packets can now be used for transmit data, supporting baseband, IF, and RF signals. Here, the time stamp dictates the transmit time, which is especially useful for generating precisely-timed radar pulses. Multi-static radar systems use one antenna for transmitting pulses and other remotely located antennas for capturing the reflected pulses. Through GPS synchronization, VRT can be used to coordinate transmit and receive signals at each site. Spectral survey systems are in widespread use for detecting and recording signals of interest. Under VITA 49.2, Signal Data packets can carry digitized spectral information from scanning receivers, and deliver packets to analysts anywhere in the world. These packets maintain full context information regarding location, circumstances and conditions, as well as a precise time stamp. The original Context Packet is also significantly enhanced in VITA 49.2. Many more types of metadata are supported for new details and richer information about the signal data. 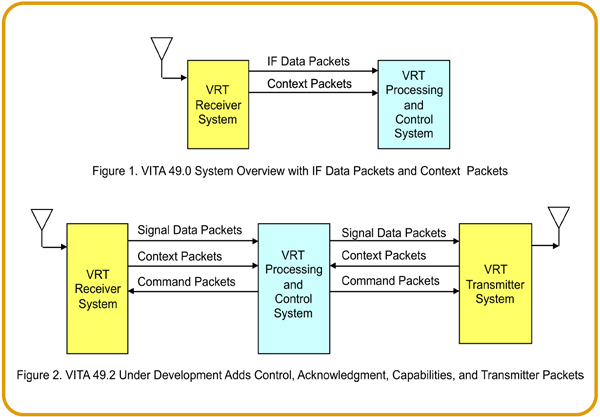 Context Packets now allow a VRT resource to respond to the system with a complete set of its operational specifications including minimum and maximum limits of each programmable parameter. This may include frequency tuning range, bandwidth settings, range of programmable gain, antenna azimuth angle limits, and range of transmit power levels. In theory, a VITA 49.2 System Processor can connect to a new, unknown software radio resource and automatically discover everything it can do, how to control and monitor its operation, and how to successfully exchange receive and transmit signals. In practice, Context Packets will be most useful when developing new applications on existing platforms, and in reacting responsibly to new threats or circumstances during deployed operations. Another deficiency of VITA 49.0 was its lack of control of software radio resources. VITA 49.2 adds a new packet class called Command Packets, which allow the VRT System Processor to deliver operating parameters to each element using the same standardized fields and formats as the Context Packets. This provides a consistent control interface across a wide class of hardware, ranging from antenna positioning systems to transmit power amplifiers. Command packets not only provide control, but also support status and acknowledgement functions so that the VRT processor can check the operational status of the receivers and transmitters to verify successful execution of the control commands. This comprehensive and complimentary control/status protocol of VRT provides an essential function for cognitive radio, adaptive spectral management, electronic counter measures, and other critical applications. Because of the diverse requirements across EW, SIGINT, radar, and communications systems for both military and commercial markets, VITA 49.2 adds Extension Packets, which are intended to convey application-specific information that is otherwise not supported in any existing Context Packet fields. Software radio SIGINT and COMINT systems attempting to locate, identify, and monitor a wide range of unknown signals can extract many useful facts from the VRT Information Stream. These can include the azimuth and elevation of a directional antenna, the reference power level of the RF signal, the bandwidth and tuning frequencies of the RF tuner and DDC, the sample rate of the ADC, the frequency accuracy of the RF tuner and sample clock, a signal ID tag, and the time stamp. Particular emphasis is devoted to time stamp accuracy. VRT time stamps allow beamforming applications to compare absolute time and phase differences between signals received from multiple antennas to calculate distance, location, speed, and heading of a transmitter. Likewise, a multi-element diversity receiver can exploit VRT time stamps to create delays and phase shifts in each antenna signal path to maximize receptivity in a particular direction. Absolute time can be derived from GPS receivers, so that software radio receivers separated by great distances can be synchronized to capture signals at the same time. This can be very useful for tracking signals from satellites or even from sources in deep space. Radar systems must capture reflected pulses during precise intervals of time relative to the outgoing radar pulse, usually defined as a range gate. When the received data is captured, VRT delivers a time stamp to the radar processing engine, showing the exact arrival time of the return signal. Before VRT, systems relied on complicated local interfaces between the receiver and the processor to ensure coherency for a given task. VRT provides an elegant solution by encapsulating parameter and timing information along with the data. A major benefit here is that the VRT Information Stream can be delivered to any number of remote processing facilities, while fully preserving the critical metadata and time stamp. Like any successful standard, VITA 49 continues to evolve as new technology emerges and through feedback from realworld deployment. With so many clear benefits and relatively little extra complexity, VRT is expected to mark the trail for new and future software radio systems.